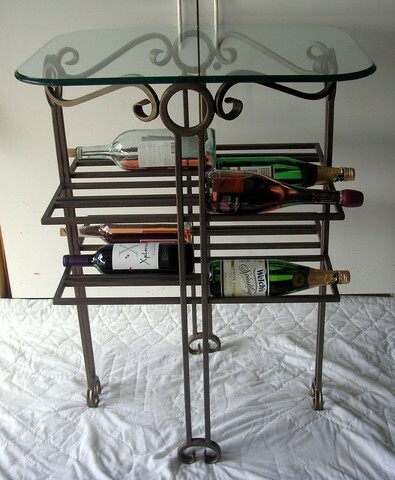 The Tall and Scrolly Table Base: This a tall but elegant table base that is able to accommodate the slimmest of wine bottles up to a 2 liter bottle of soda. The slim legs give it a delicate appearance but don’t let that fool you. This table base is constructed of iron and very sturdy. The Wine Enthusiast Table Base: This table base is the perfect piece of furniture for the wine enthusiast. It can hold up to 57 bottles of wine including 3 openings that are oversized for larger wine bottles or champagne bottle. The oversized openings are even large enough to hold a 2 liter bottle of soda. Simple and Sturdy Wine Tower: This wine storage tower is available clean and simple or with vineyard adornment. Crafted out of iron and hand painted. Offered in 6, 12 and 18 bottle solutions OR can be custom built to accommodate any configuration and any combination of wine or champagne bottles. Lead Designer at Metropolis Iron, Misti St. Pierre, states “our wine furniture is a great addition to our line of home décor, something our loyal customers have been requesting for some time” of the new line.